The definitive, stand-alone companion book to the groundbreaking documentary—now with 50 plant-based recipes with full-color photos to help you start changing your health for the better. We know there’s something terribly broken about our industrial food, medical, and pharmaceutical systems—even as medicine continues to advance, people in the Western world are getting sicker than ever. What’s going wrong, and what do we need to know to stop it? Can we avoid the leading causes of death, just by changing our diet? Kip Andersen and Keegan Kuhn, creators of the revolutionary documentary What the Health and the award-winning documentary Cowspiracy, take readers on a science-based tour of the hazards of eating animal products—and what happens when we stop. 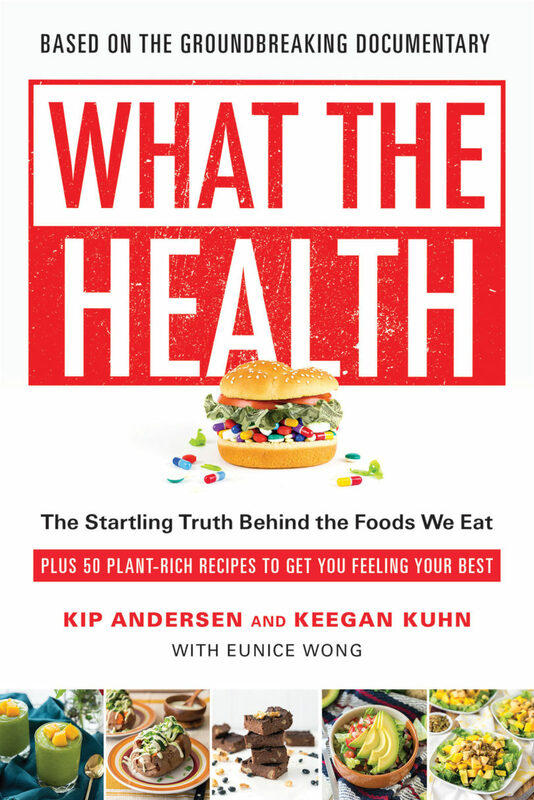 Journey with Andersen and Kuhn as they crisscross the country, talking to doctors, dietitians, public health advocates, whistle-blowers, and world class athletes, to uncover the truth behind the food we eat, and its stunning implications for our health. With the help of writer Eunice Wong, they empower eaters with knowledge: about the lethal entwining of the food, medical, and pharmaceutical industries, and about the corporate, legislative web that confuses the public and keep Americans chronically—and profitably—ill. What the Health takes readers on an adventure through this maze of misinformation with the same fresh, engaging approach that made their documentary so popular with viewers. If the film was a peephole, then the book knocks down the door itself, with expanded interviews, extensive research, and new personal narratives. There’s a health revolution brewing. What the Health is your invitation to join. Kip Andersen’s awakening as a filmmaker came as a result of An Inconvenient Truth. After seeing the film, he dramatically changed his lifestyle and believed he was doing everything he could to help the planet. But his life took a different direction when he found out animal agriculture is the leading cause of environmental destruction. Together with Keegan Kuhn he co-produced his first film, Cowspiracy: The Sustainability Secret, which became an overnight viral success and ignited the environmental movement. Following this success, he was invited to speak in front of the European Parliament and a new cut, executive produced by Leonardo DiCaprio, was exclusively released on Netflix in September 2015. Andersen is the founder of A.U.M. Films and Media, a 501c3 non-profit focused on creating films and media that promote thrivability, compassion, and harmony for all life. He is also a serial entrepreneur, as well as a certified Jivamukti and Kundalini yoga teacher. Andersen is a graduate of Cal Poly San Luis Obispo school of business and has called San Francisco home for more than a decade. Keegan Kuhn is the award-winning co-director of the highly acclaimed documentary film Cowspiracy: The Sustainability Secret, executive produced for Netflix by Leonardo DiCaprio. Kuhn is the owner and operator of First Spark Media, a digital film production company tailored to creating films for social justice. Kuhn’s skills as a director, producer, cinematographer, editor, animator and composer have been utilized in film subjects as diverse as modern Alaskan homesteading, gender inequality, animal rescues, Buddhism, endurance sports and environmental destruction. He is motivated by a deep desire to shed light on untold stories of the most downtrodden in our society, and to raise awareness through greater visibility of social justice issues. Kuhn is the owner of the camera accessory company—First Spark Gear—and creator of the educational music project True Nature. He lives with his partner Shani in the East Bay of San Francisco, California. Dimensions: 7 x 9 x 1.5 in.